Students from Seattle University created a poster and delivered a large, handmade card filled with messages of support for SPU students. We heard of the tragedy from our two kids who are SPU alumni of ’11 and ’12. Our son spent most of his four years there in Otto Miller Hall. We have since been praying constantly for strength for you all and wisdom from above for all the decisions that you had to make so quickly. May the Lord continue to be very present to you all as you provide leadership to such an outstanding university. 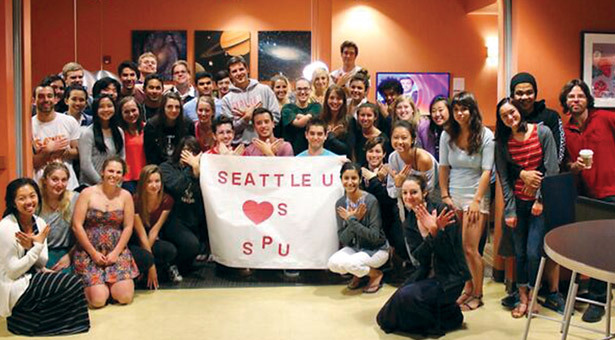 Amidst all the tragedy I must say I have never been more proud to be an SPU alum than in this hour. At every turn, SPU has shown the world that true Christianity shines light amid dark circumstances. Crisis reveals character. Crisis by nature does not allow time for scrambling together the desired image to project when the media spotlight hits. Whatever character is already present will be exposed. SPU, your character has been tested, and it has shown through with the genuine love, humility, wisdom, and grace of our Redeemer. Seattle Pacific has been a meaningful part of our lives for more than 60 years. We have applauded the new directions, the consistent growth, and the steady witness for Christ which have been the hallmarks of university life. Our hearts go out to those who suffered and will continue to need our support and prayers as they heal. Our special appreciation goes to the young man who risked his life to subdue the suspect. Be strong! Go Falcons! I’m nearly speechless, but wanted to at least express my gratitude to you for all you’re doing to help everyone work through this. My daughter is planning to attend SPU in the fall as a freshman, and never have I been more confident in her future than now. I look forward to being a part of the SPU family as she partakes in her journey at your outstanding university. Thank you. As a father and pastor (and former electrical engineer! ), I am deeply indebted for your spiritual leadership more than anything else. I have been impressed with this school from the very moment I stepped onto the campus two years ago. The caring nature of the faculty and the organization that I have witnessed has stood out to me from the very first day I visited. My daughter has been so happy at this school and has grown in her faith and knowledge. I feel that I have put my child in caring hands; I thank you for loving our kids as you love your own. As residents of the Queen Anne neighborhood, we felt somewhat violated by the attack on your campus as well. We would like to thank you, the faculty, staff, and entire SPU community for reacting in such a faith-filled manner. We are not able to express ourselves as articulately as we feel, but the demonstration of your faith was incredible. We thank you for letting us witness your belief and trust in God. We would never want this type of incident to occur in any community, however we believe your faith and convictions may have made it ever so slightly more tolerable. We are sorry you all had to experience this. Please carry on and know that others continue to care and support you. Thoughts & prayers go out to the Seattle Pacific Univ. community & all affected by this tragedy. We stand with #SPU in this difficult time. I always look forward to and enjoy reading my copy of Response magazine. Reminders of Seattle Pacific bring back fond memories of my student days on campus. Keep up the good work on your publication! I always enjoy Response, but this edition (Spring 2014) seems particularly incredible! Kudos! The articles centering on youth flourishing are heartwarming and urgent. What a wonderful way to cameo what God is doing at SPU! As a parent of an SPU alum, I enjoy receiving Response magazine. The articles are well-written, informative, and often inspiring. In response to your article “Gifts Across Generations,” (Spring 2014 Response) I would like to add my voice to efforts to explore a senior alumni and student mentorship program as in Carol Redfield’s vision. Nursing students as well as other students would engage in intergenerational situations on campus or in seniors’ living situations. We seniors would benefit from this association – perhaps inspiring us to pray for and contribute to our alma mater — while feeling our experience and wisdom is highly valued. At the same time, SPU students would gain information helpful to them in their productive years ahead. I love Response magazine. Keep up the great work! Thank you so much for your article “Her Place: In the Classroom” (Spring 2014 Response). ... I love that the call for advocacy inspired Kelsey Ryland ’08 to pursue her work and how she pointed out that more people “need to step up to the plate and care.” I hope more and more of us care, whether through promoting policy, speaking boldly with our neighbors and friends, and considering how we can purchase with a purpose.